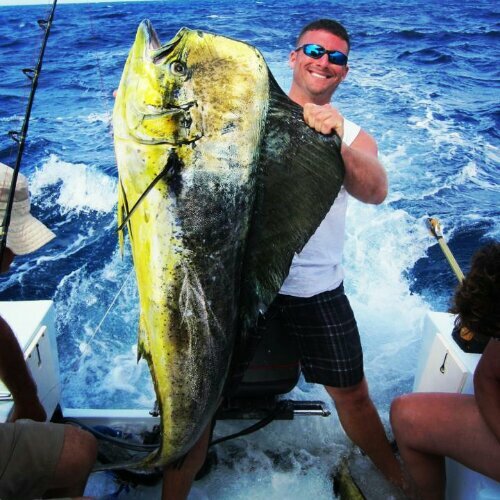 HOLY MAHI MAHI....... - Official Website of Hunt Strong, Find Your FIT! Also featured on the cover of Woods ‘N Water Magazine……. Every year my family and I go down to Ft. Pierce and spend the weekend visiting, cooking out, and Fishing! We got up early Saturday morning and my uncle, mom, brother, brother’s girlfriend, and I headed out of the Ft. Pierce inlet on my uncles 21′ Mako “Bottom Line”. This was the first year my mom was able to make it. She hasn’t been fishing since 1989. She was very excited at the opportunity to go fishing with her boys. The ride out was rough! We couldn’t rig the Ballyhoo on the way out because we had to hold on. We started fishing around 9:00 in about 120′ of water. We fished our way out to the edge of the Gulf Stream. Once we hit the Gulf Stream it really kicked up. We trolled around a bit a decided that the beating wasn’t worth it. We started heading back in to calmer waters. As we crossed over the ledge we got a knock down on the outrigger at about 10:38 in 220′ of water. I turned around from the helm and grabbed the pole. Once I tried to set the hook I realized that it was a good fish. As my brother strapped the fighting belt on me we could see the fish jumping and knew it was a good fish! 30 minutes into the fight, the dolphin came to the top jumping and trying to shake the hook! Not giving him any slack, he dove deep taking all but the nitty gritty of the line left on the Penn 30. After an hour and fifteen minute fight, and six long runs later, we finally could see a green blob coming to the surface. I swore this fish was fal hooked because I would reel down and when I pulled up he wouldn’t budge. Seemed like the only way I could make any head way is when my uncle would quarter the fish. He finally came to the surface about 50 yards away from the boat with his mouth wide open. He was not fal hooked. He was just a huge fish. My uncle yells, “reel reel reel!” As I pull him to the boat my brother makes a perfect gaff but struggles to pull the fish into the boat. Once he was in the boat we couldn’t get him to fit in the fish box. The celebration began!! To top of the day my mom catches an 18 lb bull and my brother reels in a small cow on the long line. They were all hitting on bare Ballyhoo. That is by far my biggest Dolphin and the most memorial fishing trip.